The Foundry at 41st, Lawrenceville. Photos courtesy of Chris Litherland, Walnut Capital. When Alex Simakas moved to Lawrenceville in 2000, he saw it pretty much the same way people had seen it for 150 years—as a great place to forge, cut, shape and connect metal. Of course, Pittsburgh and its environs were full of places like that. He built his business, Interlocking Deck Systems, in the shadow of the 40th Street Bridge, in a cluster of buildings where steel has been fabricated since the 1870s or so. When he sold his business in 2010, there were still heavy metals clanking around Lawrenceville, but they were more along the lines of the robots at the National Robotics Engineering Center next door. As owner of the complex, he tried to lure some other industrial or warehouse users, but interest was minimal. Art All Night, however, loved the place—hosting their massive art parties there several times. Simakas encouraged artists to use the site as their canvas. It didn’t take a lot of insight to see that the neighborhood was changing, and rapidly. “Most of the local real estate folks said, ‘Scrape the site and pack it with residential,'” recalls Simakas. But that advice didn’t sit quite right, either. Instead, he built the mixed-use Foundry at 41st. Where once 41st street met a dead-end at the factory, there’s now a clear walking path all the way to the river. That’s called Bay 4, and plans are to pack it with events, from pop-up beer gardens to farmer’s markets and live music. Simakas’ first hire was a “Bay 4 Manager,” Benjamin Herring, to get the programming going. The apartments rise to one side, arranged around a central courtyard filled with grills, pools and other amenities. 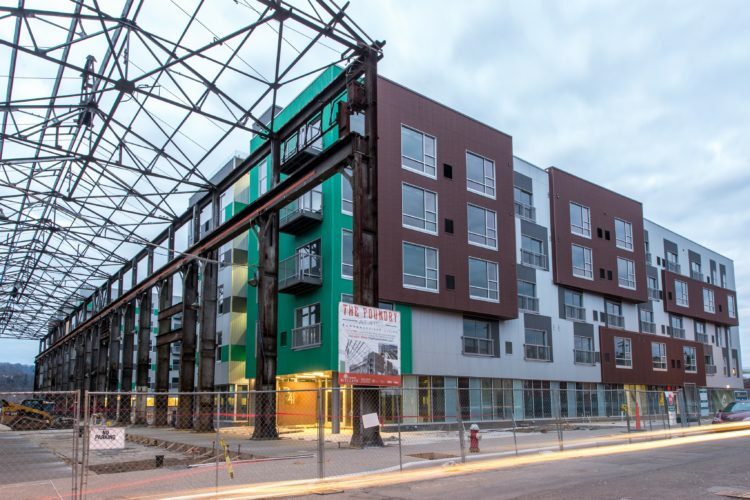 Whether you love or hate the current fashion for corrugated metal-clad apartments, it does fit seamlessly into an industrial site that’s already clad with a lot of corrugated metal. Architects Rothschild Doyno Collaborative did the design. “We went overboard on the fitness thing,” says Simakas, describing the three different gyms, one outdoors. The section fronting on Willow Street is set back, with an extra wide sidewalk, benches and green space for residents, neighbors and passersby to sit and chat. Rents for the 191 units start at $1,180 per month and can go up to $3,100 for a top-corner spot with panoramic views of Lawrenceville, the Allegheny River and the 40th Street Bridge. There’s also a large rooftop deck, where even ground-floor residents can get a piece of those views. Up top, though, it’s easy to see that some pieces of the puzzle are missing. There’s a large, empty machine shop building—probably a hundred years old, if the brick underneath is any indication—adorned with graffiti and remnants of past Art All Nights. A gigantic, 1960s Ingersoll steel-cutting machine sits outside, with a large empty lot behind it. Simakas isn’t sure what to do with the remaining spaces yet, but he’s in no hurry. He’s just pretty certain it won’t be more apartments—there’s enough of those coming online nearby. Some sort of unique live/work shop space is one idea. Walnut Capital, brought on as property manager for the project, seems to like the way it’s turned out so far. “The Foundry at 41st transforms unused riverfront land into a landmark public space and residential development that we believe will be benchmarked internationally for best practices,” says Gregg Perelman, Founder & CEO of Walnut Capital.